Hello, hello, friends! It’s almost time for the somewhat-regularly-scheduled monthly edition of Candidly Kristen, but I just returned from a two-week vacation to Europe, so I wanted to add in this quick little life update! I did schedule one blog post while I was on the trip, but other than that, I was pretty much hands-free from my blog. I have a few post ideas from the trip I’d like to share soon, but for now, I’ll keep it short and sweet. 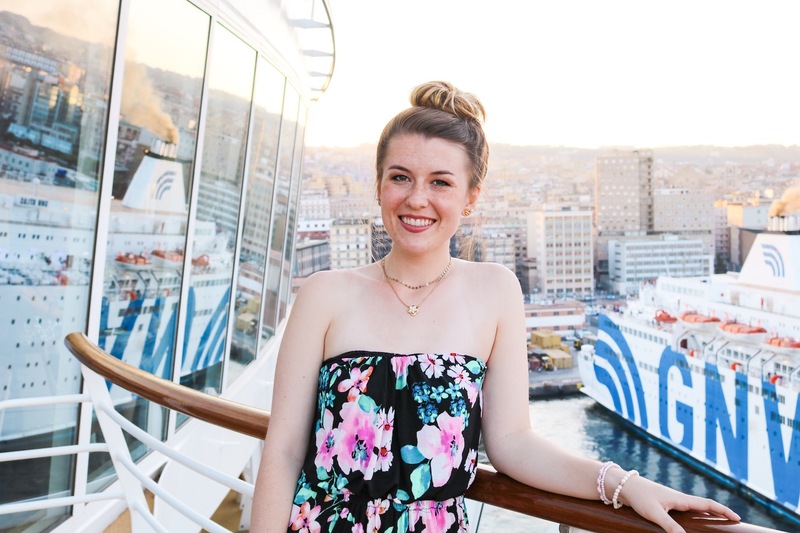 My family and I flew to Rome to spend a few days in the most amazing city (seriously, probably my fave to date), and then boarded the largest cruise ship in the world (no, actually) for a 7-day Mediterranean cruise! I’d also like to mention that I know this is a very extravagant vacation and I am so grateful and thankful that my parents were able to take us on this trip. We usually take one ‘big’ family trip each summer, but this trip was, well, especially special! My older sister just graduated from college, I’ll be graduating from Florida State this December (EEEEK! ), and my younger brother will be graduating high school this spring… whew!! So, our family has lots to celebrate. That being said, this may just be the last time for a while that all 5 of us will be all together for our annual family trip, with graduations and moving around! I don’t want any of my posts or mention of the trip to come off as bragging or ungrateful in any way. It was an incredible experience and I want to document that and share it with you! I also like to mention that I used to be terrified of flying (and am still pretty scared…) and I am not, repeat, not a fan of boats or being on the water… it scares me too! That being said, I’ve been getting a handle on my anxiety in the past few months, and I saw a big improvement in how I felt about traveling even since my spring break trip to NYC, which is huge for me!! I was diligent in taking motion-sickness medicine this trip for all the flights, boats, and car-rides (on shore excursions), so I credit that and God extra-watching out for me to say that this was probably the least I’ve ever been motion-sick or anxious from traveling, wooo!! It was absolutely incredible to visit Italy and Spain, and I enjoyed the relaxing atmosphere of cruise life, but I’m so happy to be home (and back with our three furry dog-friends). The cruise traveled from Rome to Naples, Barcelona, Palma de Mallorca, Marseille, and La Spezia! From those port cities, we also visited Sorrento, Positano, Pompeii, Florence, and Pisa. It was a world-wind, ha! I feel pretty scatter-brained from our 20-hour-long traveling day yesterday and re-adjusting to Florida time, but I wanted to pop in and update y’all on where I’ve been! Leave me a comment below if there’s anything specific you’d like to see me talk about in regard to the trip (shore excursions, the cities, what I packed, etc.) and I’d love to include that! I have some other candidly-me things to share in my upcoming Candid post, but I won’t get into all that fun stuff now. Exciting things are always on the horizon, including KristenShane.com’s 2-year anniversary!! If you just can’t wait til my next blog post, be sure to check our my Europe posts on Instagram as well! Thanks for being here, blessings always! I loved following your trip on your Instagram and Instagram Stories, and it sounds like you went to so many incredible places. I can’t wait to see all of the posts and photos from your trip! I love how humble you are, Kristen. I’m so glad you were able to go on an awesome family trip! The places you hit along the way sound absolutely amazing and I can’t wait to read posts about it! Thanks so much, Chana! Blessings!